Riding the wave of change. 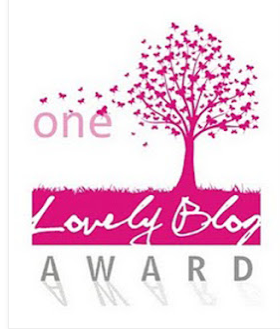 I was nominated for a "One Lovely Blog" award by Jennifer @ Runningwiththegirls. I'll be paying this forward to some of my favorite blogs. 1. Post the award logo and and picture on your blog and link back to the person who nominated you. 2. Tell seven things about yourself. 3. Nominate up to 15 additional bloggers who you think deserve the award. 4. Post a comment on the blog of each nominee to tell them him/her they have been nominated. 2. I recently got married (11/23/11). My husband, Andy, and I have been together for 6 years. We have a sweet little dog named Lucy and a beta fish named Flash. 3. I secretly want to be a farmer. The thought of having enough land to grow all my own food, have egg laying chickens, and maybe a goat or sheep (or two) makes me smile. The catch is I don't have a natural green thumb. 5. I started running in Sept. 2010, I ran my first half marathon 4/7/12, and am working toward my first full marathon. 6. I love all animals. When I find a spider in the house I catch it and release it into my garden. If I'm running and see a slug or a worm on the path I make an effort not to step on it. The only exception is the mosquito, I kill those whenever I have the chance. 7. I am a vegetarian. I tried going vegan last winter, but couldn't cut it (especially once ice cream season hit)!